God was not pleased with the people on earth but he loved Noah who was right in the sight of the Lord. God told Noah to build an ark because he was going to cause a great flood that would swallow up every living thing. He also told Noah to bring two of every creature as long as food for them and himself. God promised that he, his family and the animals would be safe. Noah’s family helped him build the ark and store up food. The people called them fools for building an ark on dry land. The animals heard God’s call and went to the ark and then the rains began. Water rose over the cities and towns but God remembered Noah and his family and all the animals – they stayed safe. Noah sent out a raven to see if it found dry land. After it didn’t he sent a dove. On its second return the dove brought back an olive branch in its beak, symbolizing it had found land. The waters dried up and the animals left the ark. Noah and his family praised God. God promised that he would never again destroy the earth with a flood and set a rainbow to show a sign of this promise. “Characters in traditional tales are typically archetypes of good or evil, described with a few broad strokes, and symbolic of our most basic human traits” (Vardell 92). Noah is our hero who is in right standing with God. Because he is not like the other people on earth, he is saved from the flood and given a specific duty to perform. I am glad that the Supreme Court asserted that “one’s education is not complete without a study of comparative religion” (Norton, 1993). I live in a Christian influenced community and not having such books on the shelf at a library would be unheard of. The pictures in this book are the loveliest part of this version of the Biblical story. I can just imagine being a child and looking at these beautiful, large water color paintings and feeling enveloped in the story. The whales swimming underneath the ark and the Earth displayed in rainbows in the back of the book gives the whole story a happy, content, calming effect. I even went as far as to add this book to my own collection (along with “Kitten’s First Full Moon”). This book did win the Caldecott Honor Award. 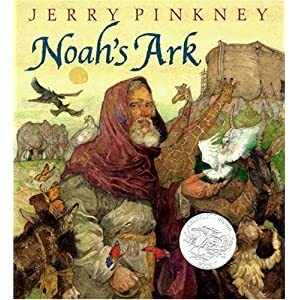 Booklist states, “One of the best-known Old Testament stories gets a powerful traditional interpretation by an artist who seems utterly comfortable with the majesty of the tale, in terms of both meaning and visual scale…Like the jacket art, however, there’s much that is exceptional here, especially an impressive, quiet view of the ark sitting patiently as rain pounds the earth and the swirling sea begins to engulf the whole world. Definitely make room for this on the shelf.” This book would be wonderful for children at Storytime at my library because they would be familiar with the story but see it in a whole new way. Perhaps reading other books by Pickney such as “The Lion and the Mouse” would be good for a themed Storytime. I think children would love the artwork in these books. The classic tale of the Three Little Pigs takes on a story of three pig brothers who were sent out by their mother, an old sow, to seek their fortune. The first little pig sees a man who has a load of straw and buys it from him, claiming that he will build his house with it. The man tells him it is not a good idea but the pig tells him to mind his own business and builds the straw house anyway in record time. Very soon a “lean and hungry wolf” tries to get into the pigs house. The pig refuses to let him in, so the wolf does, as expected, and says, “Then I’ll huff and I’ll puff and I’ll blow your house in.” Once the house falls down “he gobbled up the little pig.” The second little pig has a similar experience of house building with some sticks. He too meets the fate of the hungry wolf and is gobbled up. The third little pig is depicted as a smart one who outwits the wolf by telling him he’ll meet him at the farm, the orchard and even the fair at a later time than he really will be out. Once the wolf catches on to this, he goes to get the little pig at the fair but the pig is able to scare the wolf away by getting in a butter churn and rolling down the hill at him. By the end, the wolf goes down the chimney into the little pig’s awaiting, hot iron pot. Then, the little pig gobbles up the wolf. The plot of this story is simple and action based, as is necessary for traditional tales. The story does “move forward logically with a quick ebb and flow of action” (Vardell 93). The theme does follow the basics by being one of the “big, global messages with a clear stance on the importance of good triumphing over evil.” The gory side to this is a bit much and I was trying to recall the original “Three Little Pigs” cartoon that I saw as a kid. In Disney’s 1933 version of “The Three Little Pigs” we first hear the memorable song “Who’s Afraid of the Big, Bad Wolf.” As I watched this version, I noticed that the first two pigs seem much more jovial, naive, singing pigs whereas the third little pig is a hard-working strong type (more than likely a cultural nod to the American way of life in the 30s). It also incorporates the idea of “a wolf in sheep’s clothing” as Big, Bad tries to outwit the first two pigs. The apple orchard that is mentioned in Marshall’s version is seen in the Disney version, but only as the pigs escape as apples fall on the wolf’s head. The ending is without any gobbling and the wolf is just shot back out of the chimney with a burned bottom that sends him running away for good. It also cracks me up that the third little pig has a picture of “Mother” on the wall – a large sow, sucking her piglets. “Father” is a link of sausages! Publisher’s Weekly (July 14, 1989) reviewed Marshall’s book by stating, “Deadpan as ever, Marshall begins this one in a traditional way: the old sow sends her piglets off into the big world. Despite the protests of the tradesmen who sell them materials, both the first and second pig construct their flimsy houses of straw and sticks. In short order, they are gobbled up by the wolf. The pig who invests in bricks, of course, does the gobbling when he encounters the wolf, after a merry mass of near misses that blithely build suspense. There are fairy tales, and there are Marshall’s tales. Readers can also be forgiven for preferring his over all the rest.” Other reviews state that Marshall writes “half-fractured fairy-tales” so I think I would like to read more of Marshall’s takes on familiar stories. For activities in the classroom or library, perhaps comparing film versions to book variations would be an interesting project. I can even see having older students write compare and contrast essays on the various versions of these familiar tales. It would be something reluctant readers could get into because they would have easy to read books and cartoons involved. Honors or college freshman would be able to examine the cultural and historical impact the different variations have. Other familiar tales such as “Cinderella” or “Little Red Riding Hood” would work for this project as well. This is a retelling of an African folk tale about how Lighting and Thunder ended up in the sky. The story begins by explaining that a long time ago Thunder and Lightning did not live in the sky. The people from town and the country could chat or pat or wave to Ma Sheep Thunder and Son Ram Lightning. When the farmer needed rain they just went up into the mountain and called on their friend, Rain, to help them. However, Son Ram Lightning wanted to show off to the King and they were sent to live outside of town. Later Son Ram Lightning ate some straw hats made by his mother’s friend and the King made them move beyond the village to the center of the forest. When Son Ram Lightning’s idea to get Ox from eating up the vegetables, he created sparks that led to a fire in the field. The King heard the people’s cry and sent the dangerous Thunder and Lightning to live beyond the mountain, into the sky. Bryan’s belief is that “It is important to affirm our ancestry, to learn about our people while learning about others” (Vardell 89). Culture is an important subject for folktales and legends. It is essential that the images go along with the story and make them believable for children. Since these folktales are from one person, in a oral tradition, using their own authorial interpretation, we trust the author and his illustrations – he is the expert. I think Bryan does a wonderful job is showing us the story as well as telling it. However, I must say I found this book hard to read for a children’s book. I notice that it is shelves as “Juvenile” rather than “Easy” so it would be for older children. Still, it’s quite wordy and I’m sure it is being told in the style of the original folktale. 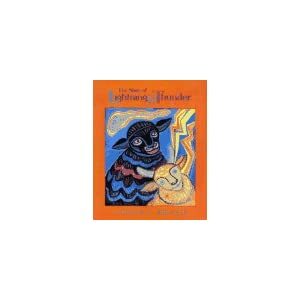 Since the supernatural element of Lightning and Thunder being a sheep and a ram would very well be very obscure for a young reader to grasp for starters, then the story being in paragraph form with a lot of detail, I don’t know how well this book would be received by children at my library. It seems like it would be more for a one on one reader type of situation. I think it would be the kind of book a parent could help a child through rather than doing the typical sing-songs thematic books of group Storytime. Booklist (September 15, 1993) reviewed this book by stating, “Bryan’s swirling watercolors depict a bright African terrain peopled with decorative, colorful characters. The text has music and style and moves along quickly, thanks to the humor inherent in the exploits of the rambunctious ram. Specific source notes are included. This is a solid title for reading aloud that will appeal to a wide age range.” Other book reviews say the age range is from 4-8. I’m still not sure that 4 would even be old enough to grasp the concept of the book but ages 7 and 8 would be able to understand it I think. One of the books that Amazon suggests as a similar book is The Story of the Milky Way: A Cherokee Tale. If a teacher were going to introduce multi-cultural folktales into their curriculum, this book would be something comparable. This book is recommended by School Library Journal and has about the same number of pages as well as a similar theme of inanimate objects being depicted as animals. Since teachers so often use Greek Myths with their older students, I think introducing them to other myths early on will give them a more varied background in legends and storytelling.